Students at Heard County High School spray painted an American flag as a senior prank. HEARD COUNTY, Ga. - Senior pranks can be silly, surprising, shocking, and some can go a little too far. The Heard County High School Principal Brent Tisdale admits this year's senior prank crossed the line. 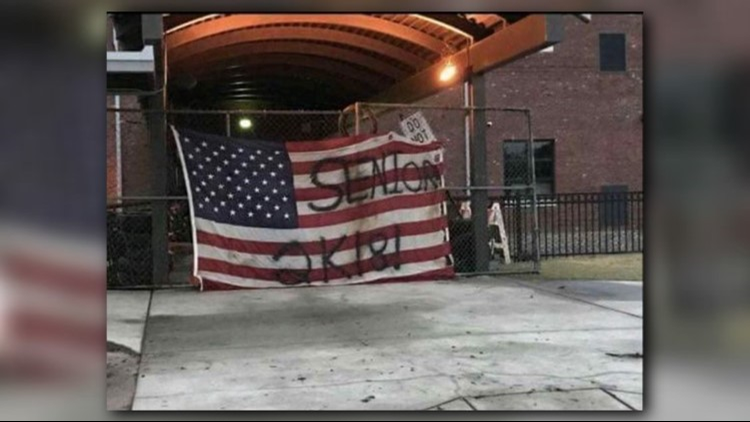 On Friday morning, 11Alive News was sent a photo of an American flag that had been sprayed with black paint which read, "SENIOR 2K18!" The person who sent the photo to 11Alive did not want to be identified but said several senior veterans were upset that the students "disrespected the American flag" and felt the students would not be disciplined. "It has been the practice at HCHS for Seniors to participate in SR Pranks and as long as there is no vandalism or damage to property we usually handle it with a grain of salt, have them clean it up, and move on. In fact, most times the SRs tell administrators about the prank beforehand. This morning, the SR prank met those requirements, but clearly crossed the line by using the American Flag in the prank. Our students did not intend to be disrespectful or insult the flag or our country, but that is indeed what happened. We share the same emotion and passion that our community does for the American Flag. We have identified the students and consequences have been assigned. More importantly than the consequences assigned, we had a group of local veterans come and speak to these students about what the flag truly represents because, despite the initial anger and outrage, we want to use this as a teachable moment for our students.Statement provided by Heard County High School Principal, Brent Tisdale"